A VILLAGE intent on marking the exact time of death of each of its villagers killed fighting during the First World War has just held its 27th memorial service. 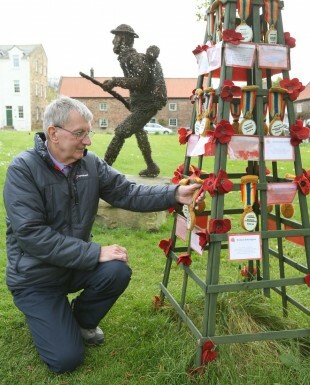 Great Ayton has been marking the day each one of its First World War soldiers died between 1914 and 1918 since the centenary of the Great War began in 2014. The parish council came up with the idea as part of a four-year programme to commemorate the war and urged residents to adopt a soldier, for whom they would observe a minute’s silence at the village war memorial on the exact centenary of their death. Each of the 2,300 homes in the village were sent a list of the names of everyone who died and a willow sculpture of a soldier was put in place on the village green. 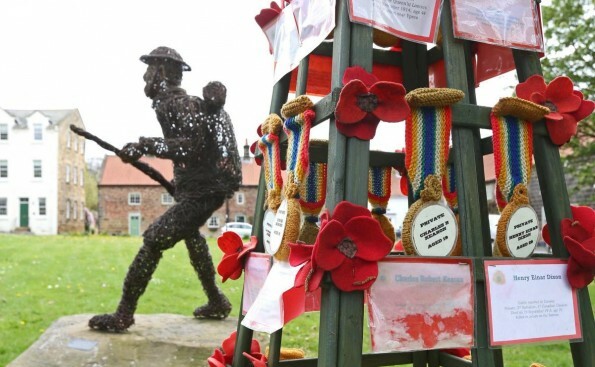 On the anniversary days a monument by the sculpture is symbolically awarded a knitted medal created by Great Ayton Knit and Knatter group. A short service of remembrance is also held in Great Ayton Christ Church by Rev Paul Peverell, when there is a presentation about the life of the soldier, including their family background and experience on the front line. Research into the lives of the villagers is carried out by members of Great Ayton History Society, including George Heron, Ian Pearce, Dave Taylor and Ernie Taylor. 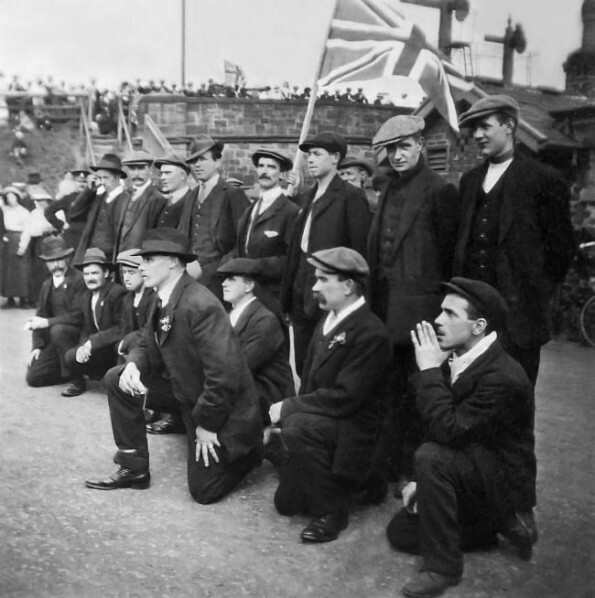 Mr Pearce said: “Caught up in the wave of patriotic spirit of the summer of 1914, the majority of young men in the village enlisted, some 330 men from a village population of around 2,800. He said not everyone’s death had been in the First World War’s most remembered and bloodiest battles, many suffered tragic deaths well away from the thick of the action. “Life in the trenches could be ‘quiet’ for quite lengthy spells, although ‘quiet’ was relative for there was always the chance of sniper fire, mortar and artillery shells, not to mention rats and lice, trench foot and trench fever, which thrived in the terrible conditions of water, mud and dead bodies which were everywhere. “Of course there were the great battles, such as Loos, Somme, and Scarpe, in which many Ayton men fought,” he said. “But one feature that stands out in looking into the brief lives of the village fatalities is that many were killed away from the great pitched battles. The next remembrance, of Thomas Stokil, will be held at 11am on Saturday, August 5.